Nelson Mandela : The Two-Way Using Mandela's clan name, by which the anti-apartheid hero is affectionately known, Obama hailed Madiba's "moral courage." Mandela, whose 95th birthday is less than three weeks away, is in critical condition with a lung infection. Obama is on a previously scheduled visit to South Africa. 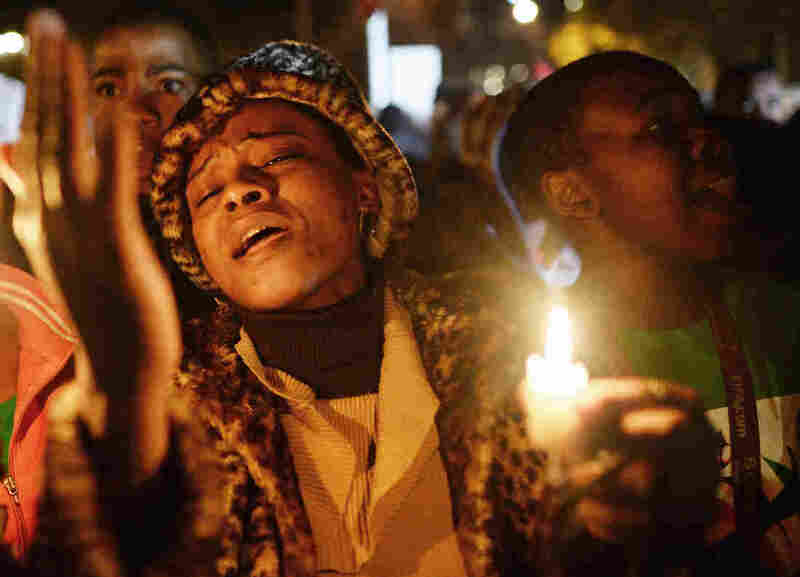 Friday in Pretoria, South Africa, people gathered outside a hospital to pray for former President Nelson Mandela. He remains in critical condition with a lung infection. Hailing Nelson Mandela's "moral courage," President Obama on Saturday paid tribute to the anti-apartheid icon and former South African president, who remains hospitalized in critical condition. Doctors have been treating him for a lung infection for the past three weeks. Speaking in Pretoria at a joint news conference with South African President Jacob Zuma, the American leader said "Madiba" (Mandela's clan name, by which he is affectionately known in South Africa) and South Africa's transition to a "free and democratic nation" have been "a personal inspiration to me ... [and] an inspiration to the world." Mandela, whose 95th birthday is July 18, has been hospitalized since June 8. In his welcome to Obama on Saturday, Zuma said South Africans "continue to pray for Madiba's good health and well-being." Zuma's office has not updated its information about Mandela's health since Thursday, when it reported that he had improved somewhat but remained in critical condition. The president told reporters Friday that "the last thing I want to do is to be in any way obtrusive at a time when the family is concerned about Nelson Mandela's condition." On Sunday, Obama and his family plan to visit Robben Island, where Mandela and others were imprisoned during the long struggle against apartheid. Mandela, NPR's Jason Beaubien reminds us, was born in a country that viewed him as a second-class citizen. But from his childhood as a herd boy, Mandela went on to lead the African National Congress' struggle against the racially oppressive, apartheid regime of South Africa. For his efforts, he spent 27 years behind bars as a political prisoner, finally being released in 1990. In 1993, Mandela shared the Nobel Peace Prize with former South African President Frederik Willem de Klerk — the nation's last white leader. They were recognized for "their work for the peaceful termination of the apartheid regime, and for laying the foundations for a new democratic South Africa." Then, in 1994, Mandela was elected president in South Africa's first democratic elections. He pledged to serve just one term and left office in 1999.
" 'I came to pray for our father Nelson Mandela. We are wishing for our father to be fine,' said Thabo Mahlangu, aged 12, part of a group from a home for abandoned children who travelled to Pretoria. "A wall of handwritten prayers for Mandela's recovery has become the focal point for South Africans paying tribute to the father of their nation, with singing and dancing by day and candlelight vigils at night. "One message read: 'If you can fight prison, you can beat this.' "
The Associated Press has posted video of the president's comments about Mandela.